What a gorgeous 2nd day at the Finger Lakes! You can't beat a beautiful 74 degree day touring another one of the Finger Lakes, Lake Keuka. Lake Keuka is different than Seneca in the fact that it's Y-shaped that is 20 miles long and as much as 2 miles wide. Lake Seneca is more narrow and long and is 38 miles long and 3 miles wide. 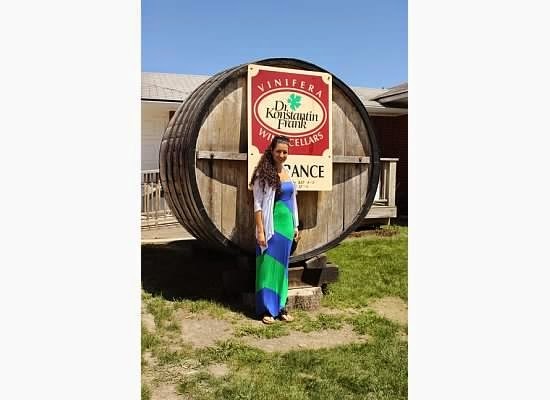 Seneca hosts more than 50+ wineries with Keuka containing around 10 wineries. 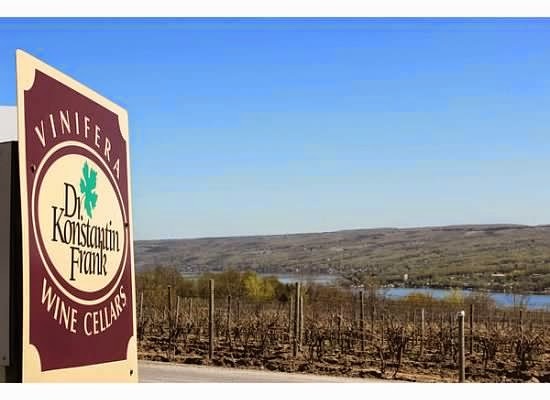 The special attraction to Lake Keuka is that the famous Dr. Konstantin Frank, whom brought wine making to the east coast. I think it's important to address such a historical figure that in 1962 he founded Vinifera Wine Cellars, now known Dr. Konstantin Frank Cellars in Hammondsport, NY. He was originally from the Ukraine and believed strongly in growing the vitis vinifera grapes, which are native grapes to Europe. 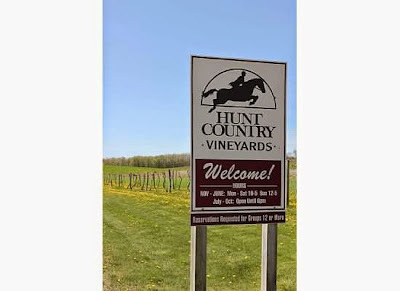 These grapes had never succeeded prior to him coming to the Finger Lakes region because of what was believe to be the cold climate here. Growing up in the Ukraine he knew that this was not the reason for their lack of success in growing at the Finger Lakes. Thankfully through his efforts and expertise the revolution of wine making of the vitis vinifera spread throughout the region and the east coast of the US. My first stop today was at Hunt Country Vineyards at the top of Lake Keuka. The pleasant piece about being here on a weekday is the personal attention. I mean who doesn't want to drink and chat about wine at 10am? 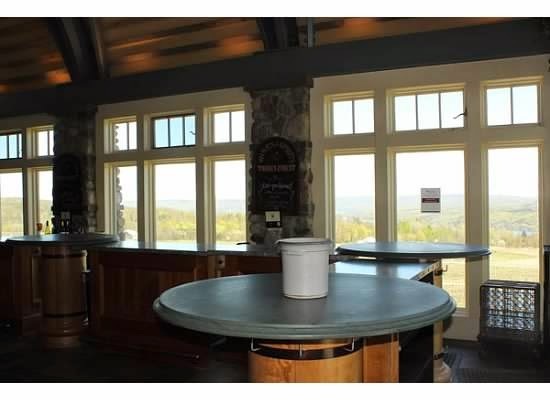 One of the neat things about this vineyard is their sustainability through the geothermal process of drilling wells and circulating water mixed with alcohol and using the earths cool and warm temperatures to heat and cool the winery. In addition they use the leftover seeds, stems and skins and combining it with manure to add it back into the vineyard and the soils releasing lots of minerals and nutrients back into the vineyard. I found their Valvin Muscat to have a beautiful floral bouquet. I always tend to enjoy this grape that was actually developed by Cornell University in the 60's. Another wine of interest that is a huge seller for them is the Alchemy wine, which is a Bordeaux style blend with another Cornell grape added, Noiret. This was a smooth, medium bodied wine with some oak hints and a little cherry and pepper throughout on the palate. Our next stop was Dr. Konstantin Frank that I previously talked about. It's hard to go wrong with many of the fine wines from this establishment. Our wine server, Alan, made this another enjoyable experience, but they always have had fantastic staff here. I'm not a fan of real dry whites, but their pinot blanc and rkatsiteli were really great with mouthwatering acidity, the Rkatsiteli having a more tropical flavor profile. The Rkasiteli grape cannot be found in many places within the US making it even more a pleasure to be able to sample it here. Again, enjoying the Muscat Ottenel here, which is just one of the major variations of muscat, predominantly known to others to be the same grape to make Moscato d'Asti in Italy. Some of the notable reds tasted today were the Merlot and Cabernet Sauvignon, both full bodied and fantastic with a steak. I typically tend to drink wines that I can enjoy on their own, including the Pinot Noir here and their Salmon Run Meritage. The Salmon Run line at Dr. Frank are grapes that are sourced from local farmers to the area. This is a more affordable line, still of quality, but not as much obviously as the Dr. Frank line itself. Just so you know I have found some of the Salmon Run wines available at the State NH liquor store and random wine shops throughout MA. I even brought it into Martignetti's myself years ago when I worked in the North End. 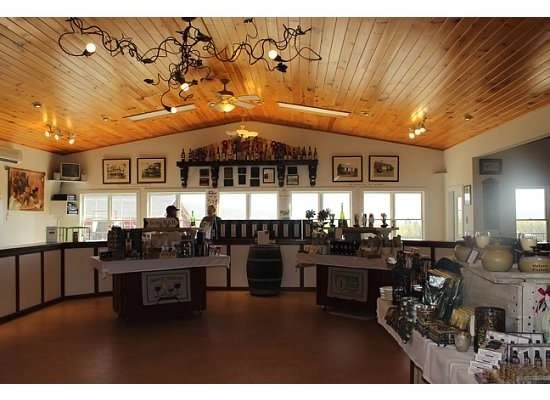 My last stop today was Heron Hill Winery. I have been here many times, but this was my most impressive time here. Maybe partially because I had more time to chat with our wonderful wine server, Tammy, or the quality was just that much better. Today we had tried some of the wines from their Ingle Vineyard line, which are the personal vineyards at the owners estate. Some of these were great including the Pinot Noir. I was torn here between the whites and reds since many of them were so great. The reds, including the Eclipse red, a Bordeaux style blend, and the classic Cabernet Franc were such well made wines that continued to develop in your mouth with every taste. Their classic Muscat, Semi-dry Riesling. where the fruit profiles exploded in your mouth at first taste. Of course we topped it off with a Late harvest Vidal Blanc, lighter in style than some other late harvests, but highly enjoyable. Enjoy over pancakes we were told. Yummy! Stay tuned for later today when we visit the other southern side of Lake Seneca!